Horse with the Flying Tail, The (film) Featurette; released on December 21, 1960, on a bill with Swiss Family Robinson. Directed by Larry Lansburgh. 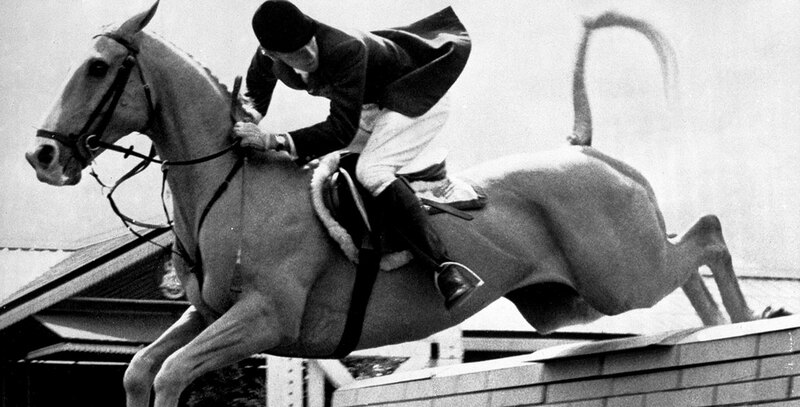 The true story of Nautical, star jumper of the U.S. Equestrian Team. As a cow pony, this palomino is noticed by an ex-cavalry man who trains him. Near disaster overtakes the jumper when he is sold to an unscrupulous trainer. However, Bertalan de Nemethy, coach of the U.S. team, spots Nautical, buys and rejuvenates him, and ships him to Europe where he finally wins the world-famous King George V cup. Made at a 47-minute length for the television show, the film was instead deemed worthy to receive a theatrical release, and it won the Academy Award as Best Documentary Feature of 1960. It was later telecast on Walt Disney’s Wonderful World of Color in 1963.